“Introducing The AQAL Cube” addresses persisting “flat-land” and reductionism issues with Ken Wilber’s AQAL Square, where “two dimensional” interpretations of “three dimensional” processes have left us with many anomalies that may possibly be corrected by the AQAL Cube. 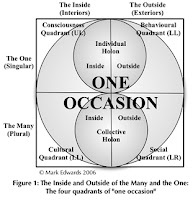 First, the AQAL Cube differentiates two domains of Consciousness: The Empirical domain of our gross, mortal being with its 4 Quadrants below; and the Intuitive domain of our subtle, non-mortal being, which inhabits the Empirical domain, with its 4 Quadrants above. Second, each of the three persons is delegated with its own AQAL Cube of eight personal pronoun-perspectives, totaling 3 x 8 = 24. The resulting myriad of binary-perspective lattices generated by the all-person AQAL Cubes, of which the classic Wilber-Combs lattice is but one, is the tip of a vast “ice-cube” of permutations of Kosmic Address, and as such is a potential model for the Human Consciousness Project. This is a difficult paper, because it calls for some key reforms to the AQAL Model. Most of us have no problem changing a bad thing for a good thing, but few would change a good thing for a better thing. Good as the existing AQAL Model is, there may be little need to change it. But like any other evolving entity, Integral Theory will itself periodically break out of outmoded forms into new and liberating dimensions. In this paper I attempt to present an argument that Ken Wilber’s 4 Quadrant Model, which I here refer to as “The AQAL Square”, can be transcended and included by differentiating an additional dimension of four additional quadrants, as an 8 Quadrant Model, which I here refer to as “The AQAL Cube”. 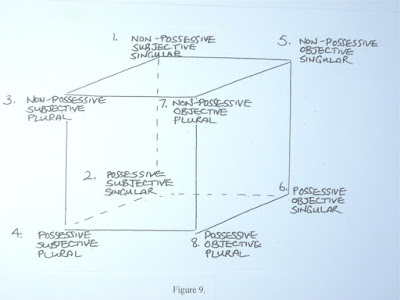 I propose the additional dimension that the AQAL Square fails to adequately differentiate is nevertheless differentiated cross-culturally by the possessive and non-possessive personal pronouns, as our material and non-material being respectively. I present the case that all our pronoun-perspectives, as aspects of our conscious awareness, can and should be integrated into the AQAL Model as the AQAL Cube. In so doing, the AQAL Cube may be able to offer many pragmatic advantages over the AQAL Square. 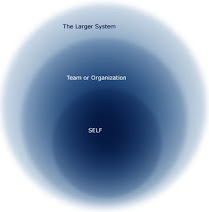 For example, the AQAL Cube would be able to delegate State Stages and Structure Stages their own quadrants, by which to map more accurately their vastly different perspectives, rather than be lines in the same quadrant of the AQAL Square. In other words, my intention in presenting the AQAL Cube is to not detract from what is offered by the AQAL Square, but rather to add to its territory another dimension that has not yet been differentiated by the AQAL Square.